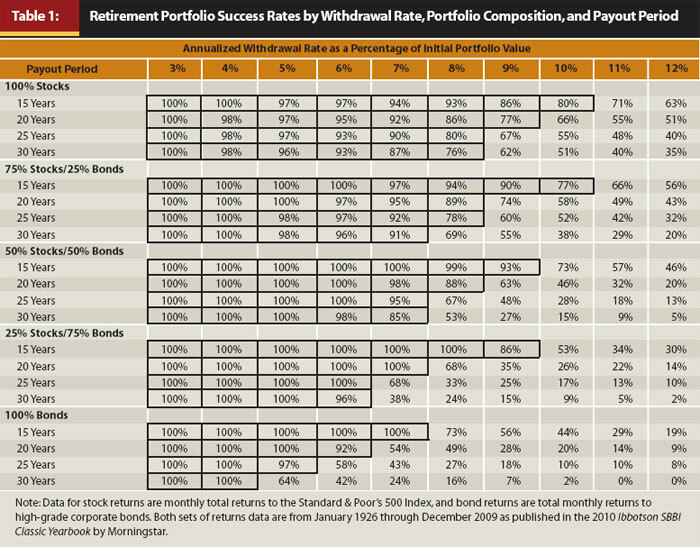 You are here: Home › Retirement › Is a 4% Withdrawal Rate Too Conservative? Is a 4% Withdrawal Rate Too Conservative? I don’t believe that one size fits all when it comes to retirement planning. The standard rule of thumb that is generally accepted across the personal finance community and standard advice from traditional media is that in order to retire, you can assume a 4% safe withdrawal rate. This is so ingrained in us that I haven’t given it a second thought in over 3 years of blogging on personal finance. I’ve since read numerous articles advocating for far lower withdrawal rates and a few stating that in some circumstances rates well above 4% may turn out to be okay. The discrepancy between these withdrawal rates and how much money someone needs to save up are vast, so determining a proper withdrawal rate can not be left to guess work or feelings. Thankfully, some exhaustive research has been conducted on withdrawal rates by looking backwards at what would have been safe over a long period of time. The trinity study looked at periods of 30 years starting from 1926 and ending in 2009 to determine what level of success portfolios with a variety of stock to bond ratios would have at varying withdrawal rates. The trinity study provides an amazing wealth of data, that became boiled down to a singular sound bite of “4% is the standard safe withdrawal rate.” This is because a portfolio with 75% stocks and 25% bonds, with withdrawals adjusted each year for inflation had a 100% success rate. Success meaning that at the end of 30 years, the number was positive. Note: The original study examined data through 1995, but an update was made with data going through 2009. 1. Past performance has NO correlation to future results. 2. The Trinity study took data for portfolios that adjusted for inflation each year, and for portfolios that did not. For the purpose of this article I am only looking at the data from portfolios that did not adjust for inflation. 3. The Trinity study assumes that regardless of what the market does, the individual will withdrawal the exact same amount of money. 4. There are 55 30 year periods in the data sample. Without Further Ado, here are the charts concerning the Trinity Study. For the data on inflation adjusted withdrawals, visit this site. What strikes me the most when looking at withdrawal rates is looking at the multiple of savings that it represents. a 4% withdrawal rate means you have 25 years of expenses in savings, meaning someone could spend 4% of an initial balance each year and with zero real growth would not run out of money for a quarter century. That’s pretty darn good. A 3% withdrawal rate would mean you could do this for 33 years, and a 2% withdrawal rate means you could maintain spending for 50 year; 50 freakin years with no adjustments and no gains. For the most part the people who advocate such low withdrawal rates do so because they expect 0% real growth over multiple decades. This has literally never happened and is very unlikely to occur. If you truly believe that stock market returns will be flat for the foreseeable future, then invest in rental real estate or start a business instead of investing in the stock market or bond market. These levels of withdrawal rates are mostly appropriate for extremely cautious investors who have the majority, if not all of their money in government bonds and low risk corporate bonds. As we discussed above, the 4% rate of withdrawal came from the Trinity study, which demonstrated that a portfolio with a 75% stock/25% bond allocation and a 4% withdrawal rate has been successful in 100% of the 55 30 year periods in the data set. 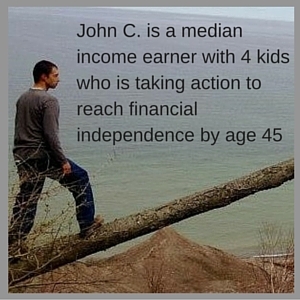 This is with success defined as having a balance after 30 years of more that $0. The median result from someone invested in 75% stocks and 25% bonds, would be a successful portfolio. 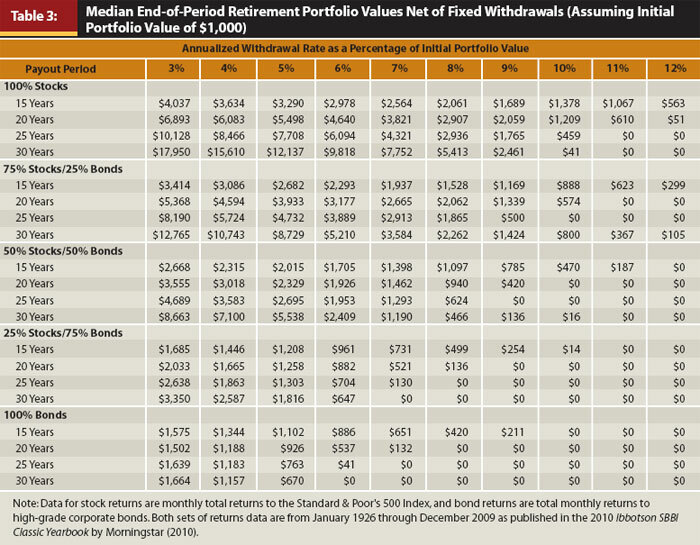 Not only would it be successful, but after 30 years the median portfolio had $10,743 for every $1,000 invested. The account grew to 10 times what it started out as. This or better was true of half of the time periods observed. While taking a withdrawal larger than 4% can certainly lower the nest egg needed, and thus the time to achieve Financial Independence, as you get into higher withdrawals your risk greatly increases, while your benefit greatly decreases. Going from 3% to 4% There is a 100% success rate and you need 8.34 fewer years of expenses in savings. Going from 4% to 5% There is a 98% success rate and you need 5 fewer years of expenses in savings. Going from 5% to 6% There is a 96% success rate and you need 3.34 fewer years of expenses in savings. Going from 6% to 7% There is a 91% success rate and you need 2.3 fewer years of expenses in savings. Going from 7% to 8% There is a 69% success rate and you need 2.2 fewer years of expenses in savings. Going from 8% to 9% There is a 55% success rate and you need 1.4 fewer years of expenses in savings. Now, as mentioned above, the Trinity study started with data in 1926 and covers 55 30 year periods. The difference between 100% success rates and 91% success rates is accounted for by someone retiring during the great depression and blindly withdrawing. Think about that for a minute. Now how does this actually affect your savings needed? The chart below demonstrates the amount of savings needed in order to reach financial independence based off of varying withdrawal rates and yearly spending. Increasing the withdrawal rate you are comfortable with can greatly reduce the time it takes to reach financial independence. From a risk reward standpoint, I feel extremely comfortable with a 6% withdrawal rate. In the Trinity Study a 75%/25% mix of stocks to bonds had a 96% success rate, meaning it was only NOT successful for 2 years in the study, (which would have been for retirements started at the beginning of the great depression). The median terminal value of $1,000 investment with a 6% withdrawal rate was $5,210. This means that 50% of the time, 27 years out of 55 years, the ending value was over 5X the amount the account holder had started with. I see a 6% withdrawal rate as being quite conservative. I honestly think a 7% withdrawal rate, provided that if there was a market down turn at the start of the retirement period the account holder would withdrawal less, would be safe. Withdrawing 7% would still have a 91% success rate, and the median terminal value has been $3,584. 50% of the time the account holder taking 7% withdrawals would end with over 3X his original balance. Withdrawal rates of 8% and above bring on substantially more risk. Just from 7% to 8% there is a 22% drop in percentage of periods that ended in success, and to what gain? The amount of money needed to go from an 8% to a 7% withdrawal rate is only 1.8 years of savings. It just doesn’t seem worth it. I personally am looking at a 6% to 7% withdrawal rate for my planning purposes. Instead of needing to save $750,000 for my $30,000 budget in retirement, If I go with a 7% withdrawal rate, I only need to have $429,000. With my yearly savings rate, this adjustment in perspective can take over 5 years off the length of time it takes me to reach financial independence, and those are an important 5 years! After reviewing this data, what do you feel is a safe withdrawal rate? Are you willing to make adjustments in down years? 15 Responses to "Is a 4% Withdrawal Rate Too Conservative?" I’ve been using a 4% rate with no increases for the last four years but I also have a pension and just signed up for early social security. After one year of rebuilding my emergency fund, I will reduce that to a 2% withdrawal rate. I am concerned about reductions in social security in 2034 and I come from a long lived family. My grandmother lived to 97, my parents are 86 and 81, my aunt is 91. The most unanticipated expense has been the increase in healthcare. As of this year my health insurance premiums are taking 32% of my pension. I think healthcare will be the gorilla in the room for all people thinking of early retirement. Yeah I think you’re spot on about health care costs, especially since there really isn’t a private market for health care. The costs will be highly variable based on government actions…yikes! I’m curious as to why you are electing to take Social Security early?, especially with such longevity in your family (a pretty good problem to have I’d say!) My parents are planning to take Social Security early because they don’t trust the govt with the money and think they will have better investment returns than the gains you get by waiting. I personally am more inclined to wait due to the longevity concern and the credits for delaying taking Social Security, 8% increases for every year is a lot of money. My health insurance does not cover vision or dental. A good part of my emergency fund has gone to those expenses. I cannot return to work to replenish my emergency fund as I am a full time caregiver to my parents. I continue to be concerned about the changes the government might make to Social Security and especially Medicare. If they go to a voucher system for Medicare I foresee increased healthcare costs. I was told to spend down my retirement accounts in order to wait and take social security later. I feel that I may need those funds in the future. Because I was a government/non-profit employee I will have mandatory RMD payments when I am 70 1/2. This leaves me with less flexibility in managing my income. I felt it was best to apply for SS now and bank as much as possible. p.s. I have a friend who also retired and attempted to live on her pension. Before she canceled her health insurance for herself and her husband she had to send her former employer a check as the cost of her health insurance was greater than her pension. Makes a lot of sense, thank you for sharing Vivian! I struggle with what SWR is appropriate like many people. If you hang out on reddit too long, the FI community there will make it seem like 3% is the only way to go. No one can predict future returns, so the historical returns are the only thing we go off of. I think 4% is very safe and going much lower than that just means you’re going to have a huge pile of cash when you croak in you 90s. I have never really considered going above the 4% rule, but I have been investigating strategies where you can raise it in bull runs and reduce it in bear markets. Just need to have flexible spending. I see the reasoning for wanting to be extra cautious before taking the plunge into early retirement 50 – 60 years is a long time, coupled with the 2000 – 2009 stock returns I get why a lot of people want to be really conservative. I may end up only withdrawing around 4% or less due to working part time for the first 10 year chunk of early retirement and allowing my nest egg to grow. I think especially for non-early retirees that 4% is over conservative. For people retiring at 65, with maybe 20 – 30 years of life left, 25X savings is way more than enough, especially with Social Security. That is a really good explanation of that study. Based on that I have saved way more than I need. I knew I was well above what I needed when I retired last year, but looking at the tables I realize now I could almost triple my spending compared to the most I ever spent when working full time. That’s kind of wild. But I won’t, I think once you have enough spending more is likely to decrease happiness. I don’t need more things and the experiences that matter don’t really cost much. But it does tell me I need to start giving more away, thanks. I completely agree that 4% is too conservative for most part. It’s also supposed to last the “average person” until age 90, assuming retirement at age 65. That’s far longer than the average lifespan. Over most periods of history, it would have been possible to build a portfolio with reletively reliable income streams of over 4% without even tapping into principle. For myself, I’m considering myself financially free only when my investment income streams exceed my living expenses, regardless of my net worth value. I’ve read a lot of FI blog posts in the past month and most of them debate the merits of 2% over 3%, over 4% and beyond. Here’s how I see it. If a couple saves up $750,000 and invests it in dividend paying stocks, they can conservatively earn an income of 4% or $30,000 (assumes dividends only and no growth). Add in social security and you’re up to $40,000 at least. In making this statement I’ve assumed that 1. Inflation doesn’t impact income rates (and it does), 2. People can live off $40,000 (can’t they? ), 3. Social Security keeps up with inflation (which it does in Canada) and 4. There are no income taxes paid on $40,000 (based on my scenario above, the federal rate would be 0% and the provincial rate around 1%). Assuming #2-4 are true, a person wouldn’t need to touch the principal. BUT, that doesn’t account for #1… inflation. I know very little about inflation and how it will impact my income in the future. Do you have any good calculators that provide numbers including inflation? I really enjoyed this blog post but secretly wished that it had allowed for inflation. Thank for sharing your journey with us. Clarification. #1 should have read “1. Inflation doesn’t impact income rates as it relates to BUYING POWER (and it does)”. I think your Social Security numbers are a little high, The median US benefit is $1,300, which for a married couple would equate to around $30,000 per year. Inbflation is perhaps the most difficult part to plan for because it has varied so wildly historically and across the world. We have a FIAT money system and a Federal Reserve that really likes to print money. I’m actually shocked inflation has been as low as it has been for the last 10+ years. I think it’s important to have a few hedges against inflation, so that the effects of inflation aren’t as damaging. 1. Own Real Estate and Stocks: Both of these asset classes tend to rise in inflationary times. 2. Grow your own food. The more of your own needs you produce the less of an effect inflation will have on you. 3. Wait as long as possible to take Social Security. Social Security is indexed to inflation, so the longer you wait to take Social Security the bigger benefit it is. As far as calculators for inflation go I would look at the one https://data.bls.gov/cgi-bin/cpicalc.pl from the Bureau of Labor Statistics for running comparisons from the past. Most people tend to assume 2 – 3% annual inflation. So, if you are expecting to get 10% market returns, and you expect 3% inflation, just project your gains at 7% instead of 10% and your projections become inflation adjusted. Interesting. Especially in context of early/long retirements, I think you need to assume CPI adjusted withdrawals. The Fed’s target of 2% / year would deflate real consumption by 55% over a 40 year retirement. Once you make this adjustment a 7% withdrawal rate implies a 6.42% [ =rate(40,-7,100,0) ] annual portfolio return on an after-tax / after-CPI / after-fee basis. That’s a pretty aggressive assumption, no? I personally don’t think expecting a 6.42% return is an aggressive assumption. I think 10%+ is aggressive. As the Trinity study shows withdrawal rates of 7% were feasible for most of the markets history. The overall key is flexibility. Being able to take a smaller withdrawal if the portfolio is decreasing in value, especially early on is highly important. I most likely will not take 7% withdrawals, but at the point where I have enough money where 7% withdrawals would provide 100% of our expenses I will most likely stop adding contributions to our retirement accounts and let time compound our savings for several years. The number one hedge against inflation is probably your Social Security money, which does index for inflation. One of my problems with chaining my assumptions and withdrawal strategy to CPI is that much of what’s in the CPI is irrelevant to many retirees. For example CPI includes housing, transportation, and education. With a paid off house, modest paid off vehicles, and no education expenses, a good chunk of CPI doesn’t matter. For us particularly, we are starting to grow more of our own food and I suspect that we will produce north of 50% of our food ourselves by the time we hit retirement, which will also keep CPI from being an accurate reflection on price increases. Hi John. I read a comment of yours on Financial Samurai which led me here. Just a note that I enjoyed this article. I’m sticking with a 3.3% withdrawal rate in the future, but I found your points about the Great Depression influencing the numbers interesting. I didn’t know that about the 5-7% withdrawal rates basically working if you excluded the GD. Thanks for stopping by! I think it’s certainly wise to aim for a smaller withdrawal rate. It gives me a lot of piece of mind knowing that I *most likely* will be OK once I hit an amount that would provide our living expenses with a 7% withdrawal rate. I will most likely continue adding to my nest egg and settle on a lower rate by the time I actually take withdrawals.